Something must have gotten into me….I’m updating my long lost blog. For the last couple of months I’ve befriended some Indonesian (living in Europe) blogger/photographer/busybee mothers from instagram. They are all so talented and creative in their own way; baker, food photographer, lifestyle photographer, designer, master crafter, writer etc. I feel like we are on the same page although that doesn’t mean I’m saying I’m as creative as them. And most of them own a running and kicking blog, unlike this one. There’s a saying, hangout with people you want to be so their energy will draw you into doing what they’re doing. I guess I have to say I agree with this one. So there my friends thank you for the motivation. Now talking about this dish. I made this last wednesday to cater dinner for 20 people. Cooking for many people I’ve done time to time for my own house parties but this! To cater paying customer, that’s another story. For the life of me I couldn’t find one more menu that would fill in the gap nicely. I of course consulted my dear teacher Mbak Rachmah, and yes she always come up with good ideas. She even gave me the recipe. Oh dear I felt like a total amateur until this point. But long story short the catering went well, all plates were clean! I’m happy again. For the catering I only cooked the egg version but since I have 2 red snapper lying around in the freezer calling me to cook them, I fried them for myself and for my lovely neighbours. Also since the catering was for the Dutch, I didn’t add bird’s eye chili but feel free to do so if you like it hot. For approximately 10 eggs or 3 fish. – pound the spices except lemongrass until smooth. Fry the spice mixture in some hot oil until fragrant and cooked. Add some water and stir in low fire until boiling, add sugar and salt. Correct the taste as you wish. – For presentation purpose I didn’t mix the eggs together with the sauce inside the pan, but feel free to do so if you wish. 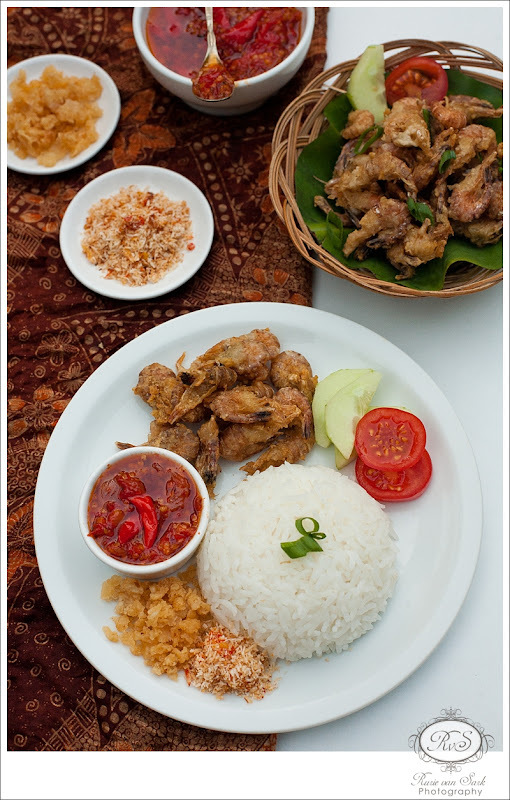 Trivia: don’t be fooled by the name, this dish comes from Java and doesn’t even exist in Bali. 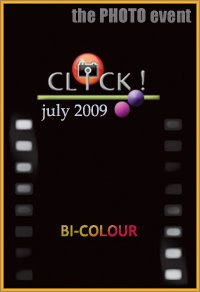 For the story do visit my photo blog here. – Mix shrimp with salt and baking powder, mix together nicely and let aside for 15 minutes. – Mix together all flours with pounded garlic, add shrimp and toss until the flour is evenly coating the shrimp. – Heat the oil in a pan, fry shrimp until golden. Repeat until all shrimp is fried. – A teaspoon of the made sambal Bu Rudy. – Heat nonstick pan, add sambal and the coconut. – Turn it around now and then until the coconut is dried and sambal is incorporated throughly. – Mix the leftover spiced flours with some water. – Fry the leftover batter in the oil until golden. – Peel shallots, cleaned the shallots and chillies. – If the shallots are too big (it’s always the case here in Europe), cut them into two pieces otherwise let it be. – Heat oil in a pan, fry both shallots and chillies until fragrant. 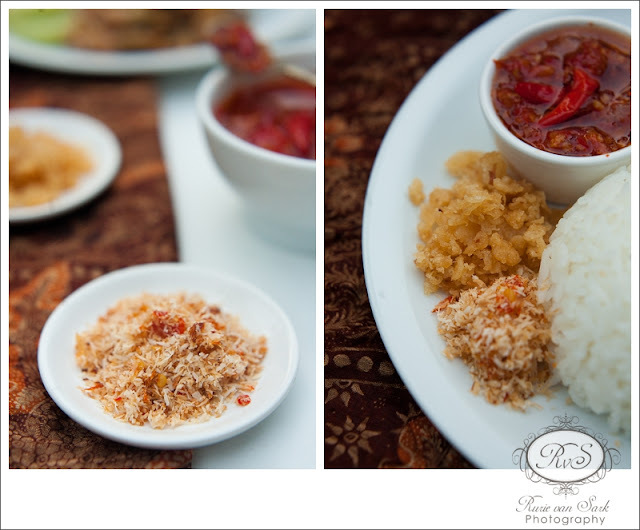 – Heat the same oil back and fry the pounded sambal until done. – This recipe will yield two 150gr jar, you can safely keep it in the fridge. But don’t forget to sterilize your jars prior using. – Serve everything together with steamed white rice and sliced cucumber and tomatoes. My better half does like fish but not those with strong fish smell or taste, is that weird or what? Though after looking at people around me, most people here don’t like the kind of fish that we like with strong fish smell and taste such as pempek palembang, siomay, batagor or even ikan pindang. 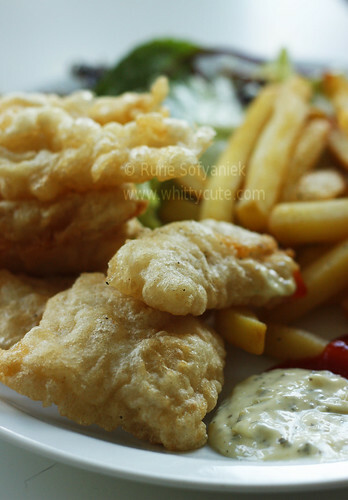 This fish and chips he does like because the fish was white with delicate flavour and texture, one of his favorite. – Pat the fillets dry with paper towels. Put the 1 tbsp of flour on a plate and use to coat each fillet, patting off the excess. – Pour the oil for frying into a heavy, medium non-stick wok or wokshaped pan. Heat to 200C (use a thermometer so you can check the oil stays at that temperature). – Mix 50g flour, cornflour, a pinch of salt and some pepper. Lightly whisk the egg white with a balloon whisk until frothy and bubbly, but not too stiff. Pour the water into the flour mix, gently and briefly whisking as you go. The batter shouldn’t be completely smooth. Add the egg white, then lightly whisk in just to mix. Try and keep as many bubbles as you can so the batter stays light. – Cooking two pieces of fish at a time, dip them in the batter to coat, let some of it drip off, then lower into the hot oil using a slotted spoon. Fry for 5-6 mins, making sure the oil stays at 200C and turning the fish over halfway through so it is golden all over. Lift out with a slotted spoon, drain on kitchen paper. Check the oil is back up to 200C, then repeat with remaining fish. Serve the fish with chips and lemon wedges. Yay it’s one of my favorite food as the theme of this month’s MasBar. I couldn’t eat seafood often in Holland, apart from some types of fishes, seafood are quite pricey. But just the other day I discovered cheap prawns and seafood at the deep-freeze section of the Asian supermarket. However the thing is, they came in a 1 kg box and I couldn’t separate them apart. I got no other choice but to thaw them all and cook them all at once. So I ended up with two kinds of prawn dishes and no one to eat them but me because my better half didn’t like prawns. Uh oh problem again. But I got clever (if I may say so) solution for that. I divided the dish into separate one person portion, and freeze them. So whenever I got I-have-to-eat-prawns-now-no-matter-what moment, I could thaw my treasure from the freezer. This sate dish is real easy and fast to make, inspired by those beach side seafood cafe in Jimbaran, Bali. Though it would be nicer if you could marinate the prawns overnight in the refrigerator before grilling them. 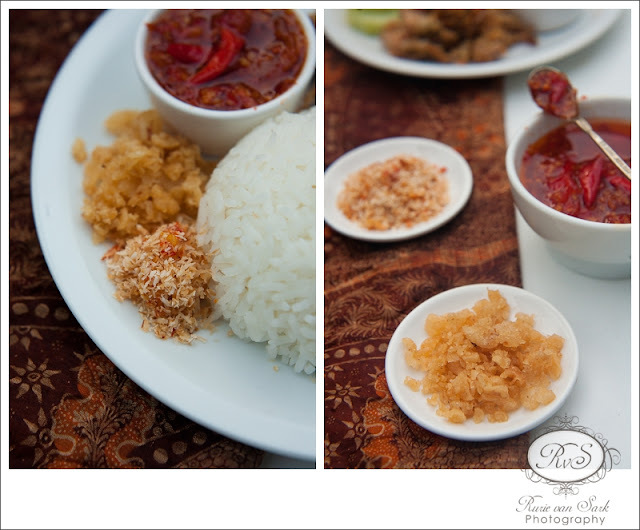 Don’t forget your hot steaming rice and sambal kecap (or any other sambal of your choice). – Squeeze lime juice over prawns and set aside for 30 minutes, drained. – Grind garlic, turmeric, candlenut, coriander, ginger, salt and pepper until smooth, mix with little bit of vegetable oil. – Smear over prawn and marinate overnight. 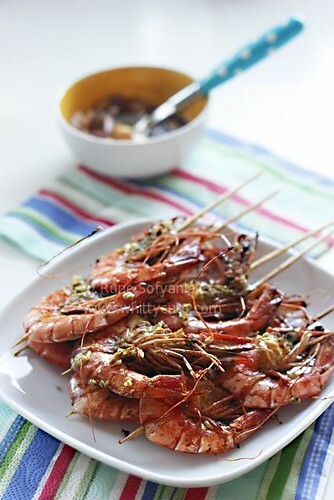 – Arrange prawn on the sate skewers and grill each side until done. 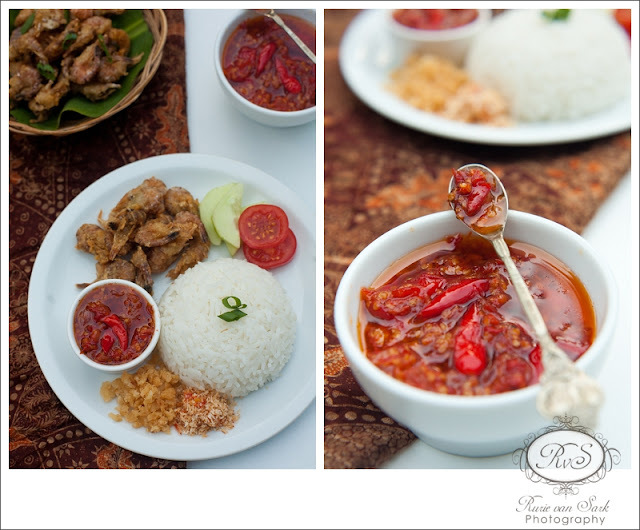 – Serve warm with sambal kecap. Berhubung hasil polling bulan kemarin seri antara Bento dan Masakan Indonesia Berbahan Dasar UDANG, maka untuk memenuhi permintaan penggemar, maka bulan ini tidak perlu lagi diadakan polling dan hasilnya merujuk pada hasil polling bulan lalu. Berhubung pada bulan lalu udah bikin BENTO, maka bulan ini temanya adalah Masakan Indonesia Berbahan Dasar UDANG. Gimana temans, Udah siap dengan menu andalan kalian??? Tentang resep, tidak ada aturan baku. Dipersilahkan browsing dan tidak tertutup kemungkinan untuk berkreasi sesuai selera. Tapi sebaiknya menyebutkan sumber resep yang digunakan. Bahasa yang digunakan saat posting juga tidak perlu sama, mau pake English atau bahasa lainnya juga boleh. 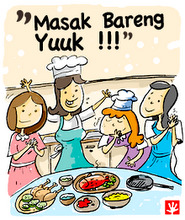 Tema menu, Polling, dan Jadwal posting bulan berikutnya akan diumumkan setelah penayangan Round up Masak Bareng. So, sempatkan aja melihat-lihat update beritanya. Jangan lupa kalo udah naik tayang, kasih kabar ke kami (silahkan isi SB) & ke foodie blogger lainnya. I’m back ^_^ Ok ok I admit, I didn’t post much lately and I have to say I was also very ignorant with my surrounding ie; with friends, news about the world etc…..sob sob but I promise I didn’t do it on purpose. The past 3 weeks was really (I mean really) hectic. What with the preparation of our wedding and the wedding itself (yes I’m married now ^_* ) and little holiday with my parents. It was really lovely time but I’m little bit glad that it was all over and now back to real life. For the past three weeks we’ve been stuffing ourselves with take aways, eating out and my parents cooking (hmm I like this part) and now I still don’t feel like big cooking. I made this photo couple weeks ago but yesterday I (or rather we) made this again with premade pizza base and tomato sauce. I would say this is my kind of pizza, spicy and fishy with a bit of tang from the rucola. – Preheat the oven to 200Celcius. – Spread tomato sauce all over pizza base. – Drizzle with little bit of olive oil. 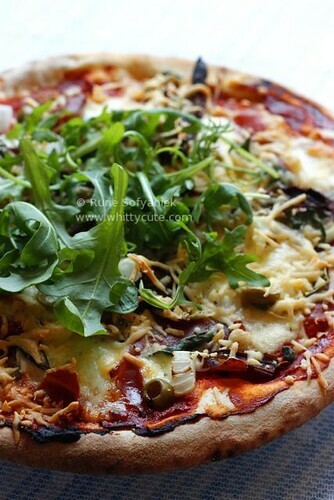 – Divide anchovy, jalapeno, onion, basil leaves, olives all over the base. – Bake for 10-15 minutes until crispy. – Serve with rucola scattered on top. Time flies when you are having fun, suddenly without realising it’s already the end of August which means time for Masbar. What an interesting theme we got this month, sambal. I don’t think any Indonesians can live without it. 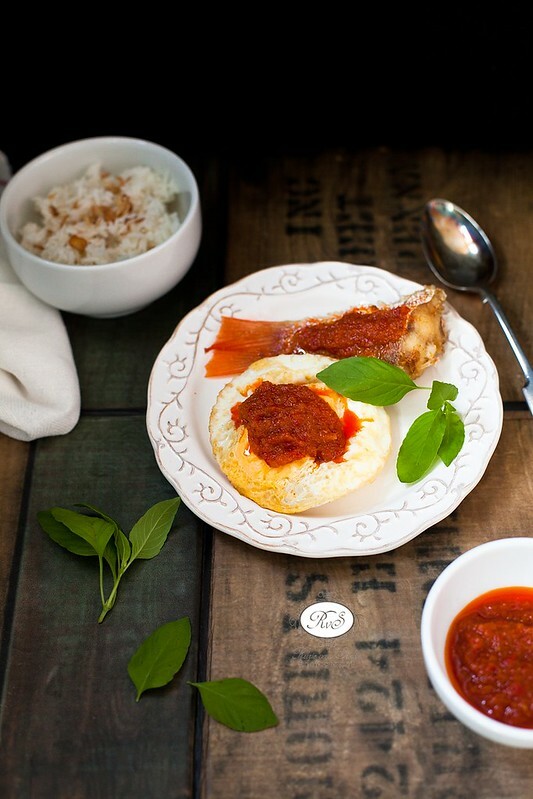 We love sambal so much that every region has it’s own signature sambal, and this one is from Bali. 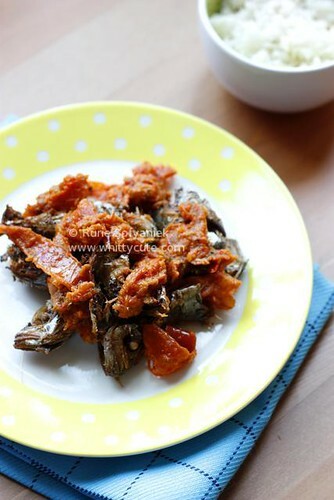 – 500 gr be pindang (salted fish) if you couldn’t buy ready made pindang, you could try to make it yourself, click here. 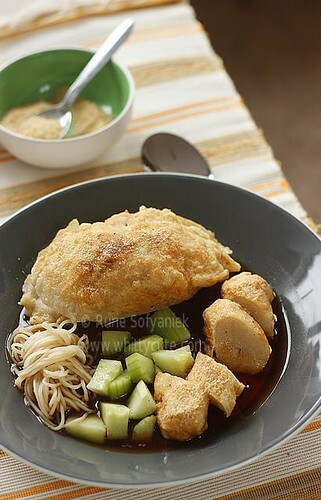 – Fried be pindang in hot oil until done, set aside. – Heat the coconut oil in a wok and fry the shallots, chilies and tomatoes for about 5 minutes. – Leave to cool slightly, then use a pestle and mortar to pound them to a fine paste. Stir in the palm sugar and salt. 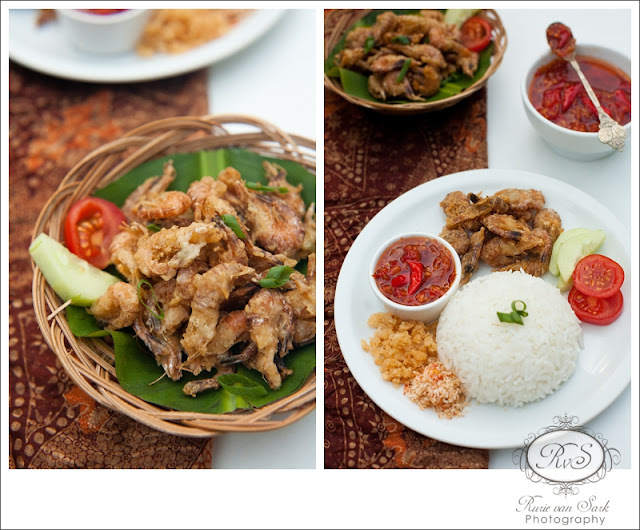 – Serve with fried be pindang and white rice. If you are tired of the same old spaghetti bolognese you could try to make it this way. It tasted just like lasagna but with different texture and most importantly it tasted yummy. 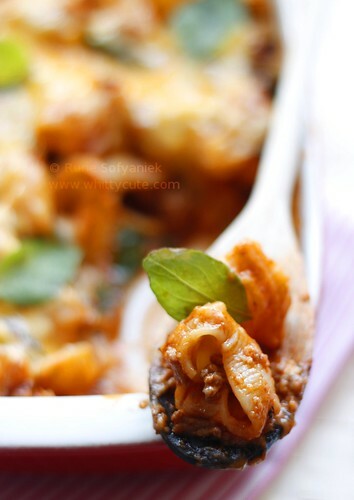 – 300gr of pasta of your choice, for example penne rigate like I used here. 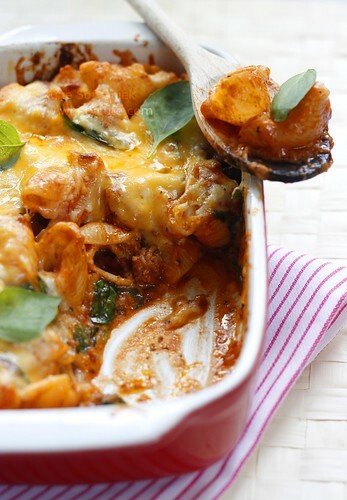 – Layer the pasta along with bolognese sauce, bechamel sauce, shredded Gouda cheese. – Repeat layer one more time. – Bake in preheated oven 180C for 20 minutes or until bubbly. – Serve with salad and ciabatta bread. Back home I always complained whenever my mother cooked tempe because I feel I’ve eaten it too much and I got enough of it. But now give me tempe anytime of the day and I would happily eat it. This dish is easy to make even though it looks rather complicated but it’s worth all the effort. – Pound spice paste ingredients until smooth with a pestle and mortar or in a food processor. – Fry spice paste mix with vegetable oil until fragrant. Take off from fire add salt and sugar, mix well. – Mix pounded tempe, seafood medley, coconut milk, egg, red chili, shallots, spring onion, hairy basil and fried spice paste. 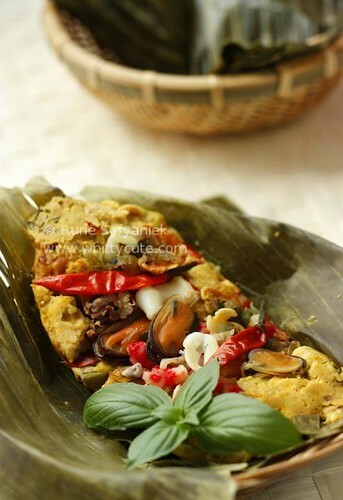 – Take one banana leaf, place one salam leaf in the bottom and add the tempe mix. Wrap the leaf with tooth pick. – Steamed for 30 minutes until done. Grilled until fragrant.